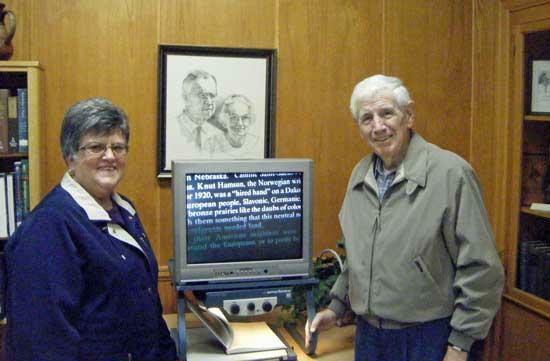 Shirley Staats, executive director of Middle Tennessee Lions Sight Service, and Austin Jennings, president of Dr. and Mrs. J. F. Adams Memorial Association and a member of the Woodbury Lions Club are shown with the newly-installed Closed Circuit TV reading device at Adams Memorial Library. Adams Memorial Library now offers support to the visually handicapped with a Closed Circuit TV (CCTV), thanks to the Woodbury Lions Club and the Middle Tennessee Lions Sight Service. The device enlarges any reading material placed under its lights and projects the result on a television screen. Any person with a problem of reading normal size print is welcome to use the CCTV and will be trained on its use by the library personnel. 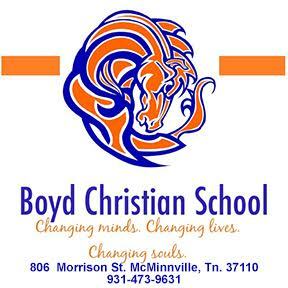 This is another service provided to the visually handicapped by the Middle Tennessee Lions Sight Service through the local Lions Club. Funding for the services come from money raised by the Lions Clubs on White Cane Days and at other fundraising projects. Any Lions Club can refer a patient to the Sight Service for major ophthalmic examination and/or treatment at The Tennessee Lions Eye Center located at Vanderbilt University Medical Center in Nashville.